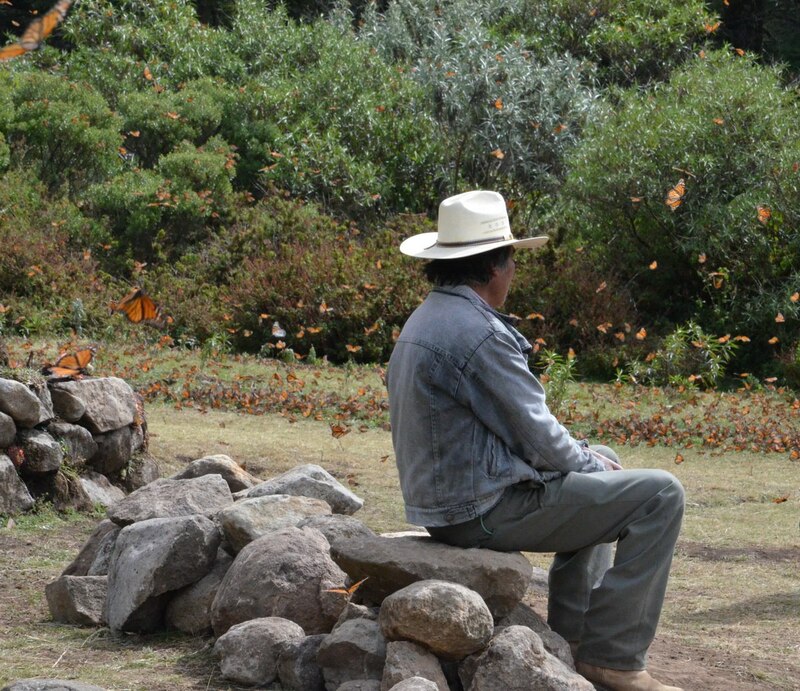 For a number of years now, Bob and I have intended to go to the Sierra Madre Mountains in Mexico to witness the spectacle of the Monarch Butterflies that winter there. 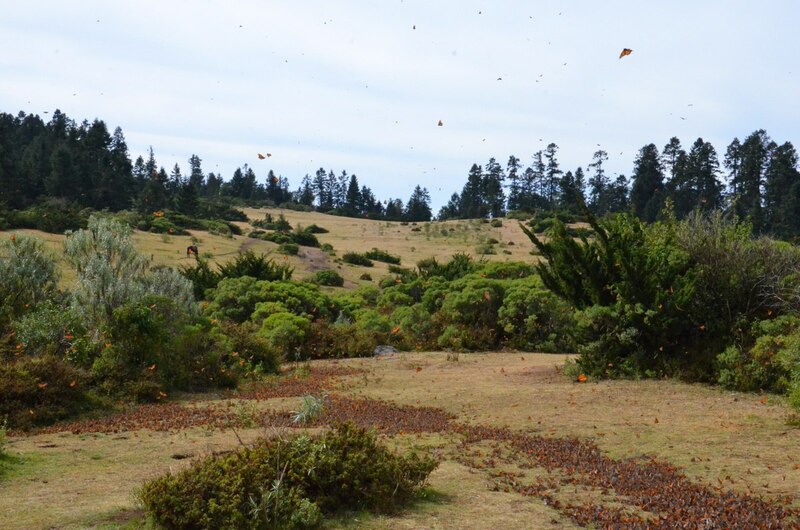 We realized our dream in January 2015 when we flew into Mexico City, and two days later found ourselves at El Rosario Monarch Butterfly Sanctuary in the State of Michoacán. The sight literally brought me to tears. 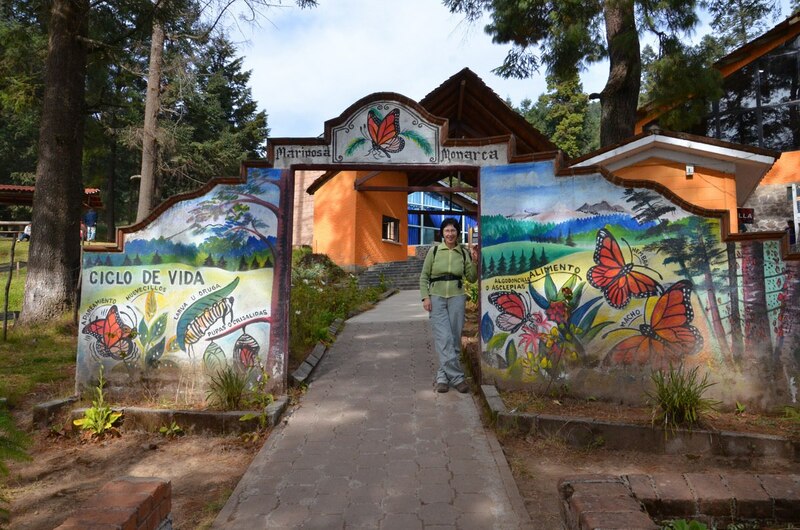 We were staying in the town of Zitacuaro about 1.5 hours south of the Reserve, which is part of the Monarch Butterfly Biosphere Reserve. 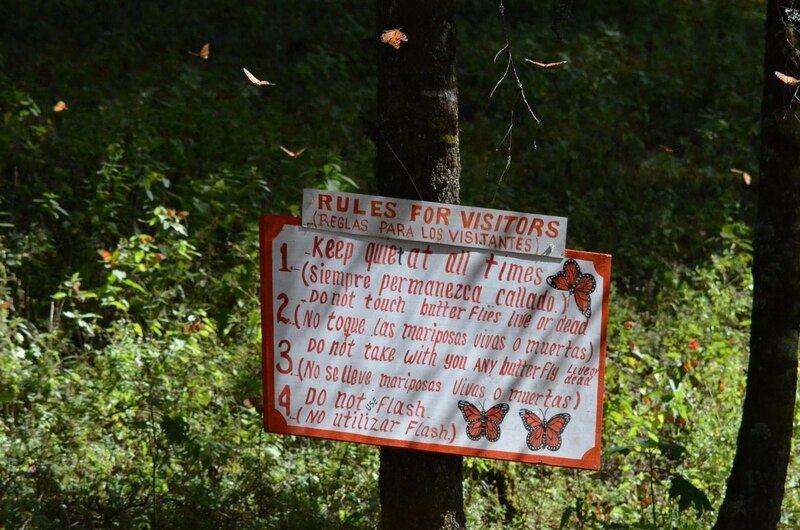 It was recommended to arrive around 10:30 a.m. so that, by the time we hiked up the mountain, the butterflies would be active having been warmed by the midday sun. This is me at the entrance gate to the Visitor Centre. Bob and I had viewed the IMAX movie, Flight of the Butterflies, a year earlier, and that certainly piqued our interest in experiencing the annual mass gathering of these beautiful insects, but also, this past summer, we were fortunate enough to find in Tommy Thompson Park in Toronto one Monarch Butterfly larva that was about to pupate. 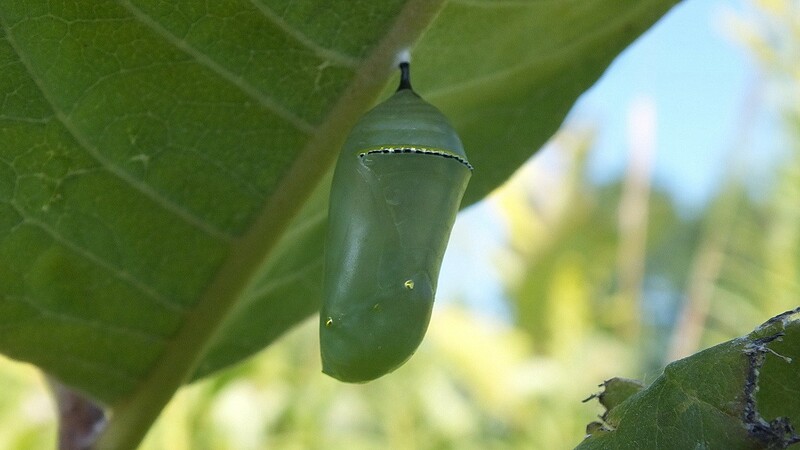 Over the course of two weeks, Bob and I made regular trips to the Park to monitor the progress of the chrysalis, but sadly, the adult butterfly emerged in our absence. Being late September, we were certain that “our” butterfly would be making its way to Mexico. Even later in the month of September, Bob and I reacted to a post on Facebook about a flutter of butterflies at Colonel Samuel Smith Park in Etobicoke and made our way to that location early the next morning. The previous day’s collection of butterflies had vanished, but by late afternoon, we were fortunate enough to locate another group of these handsome insects gathering in the treetops for the night. That pretty well sealed the deal for us. 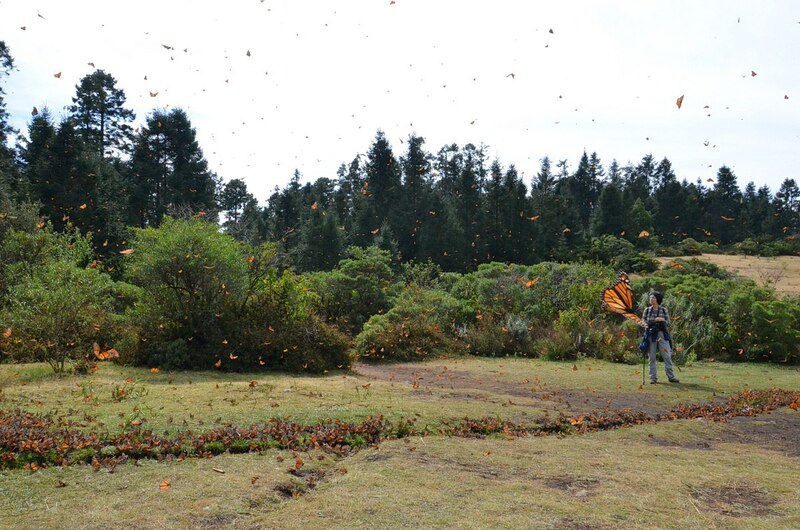 We had to go to Mexico to see where all of these Monarch Butterflies were going to hibernate for the winter months. 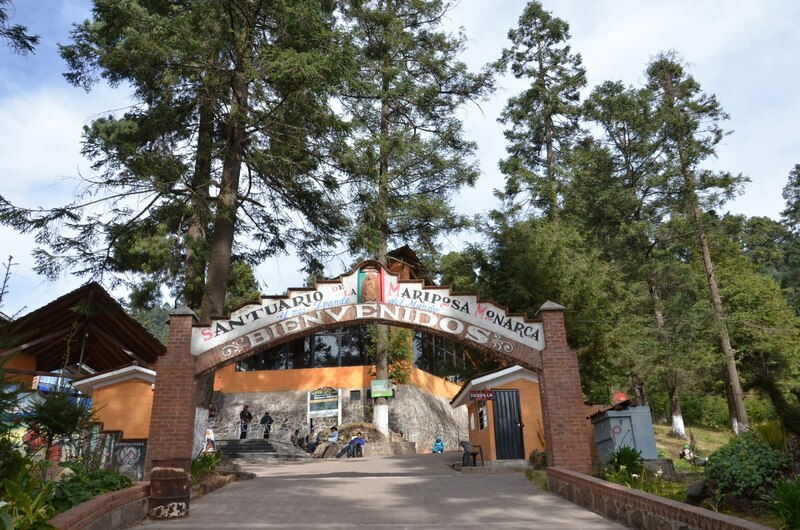 So, back in Mexico, after a fairly straight forward drive from our hotel, we found ourselves at the gate of Santuario de la Mariposa Monarca “El Rosario” near Ocampo and prepared for the hour-long hike up through the forest of pine and oak trees. Even before we hired our guide, I got stung by a hornet, not a good way to start the outing. 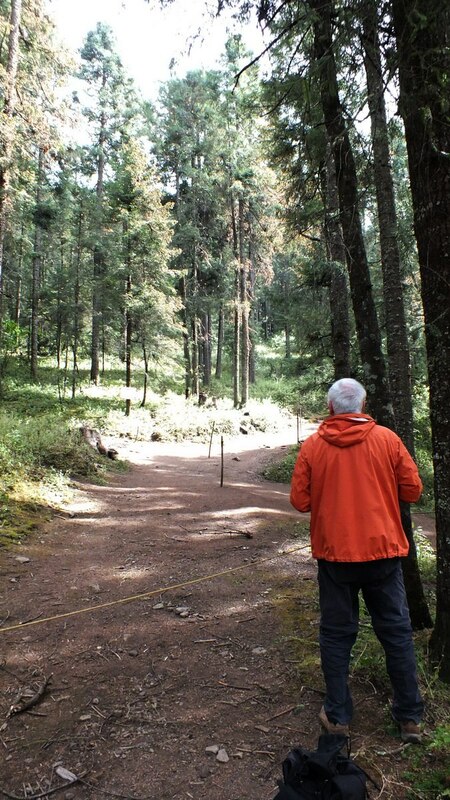 With butterflies in my stomach, a high level of anticipation, and a swollen ring finger, Bob and I set off with our guide along the initial steps of a well-maintained walkway. It may have been the altitude making me a little light-headed, but I rather think it was because I was stressing about my swollen finger, which was growing fatter by the minute. I was grateful for the provision of wooden benches every so often where I hung my head between my knees and took sips of water. 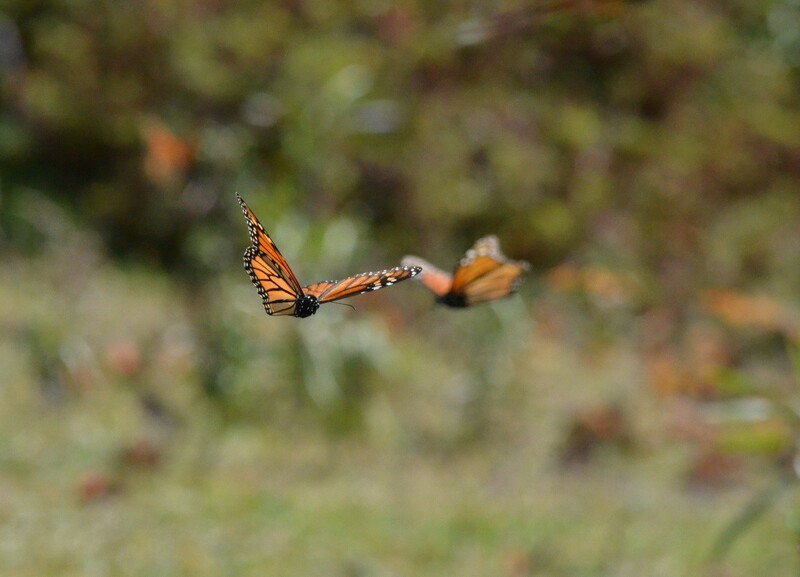 As we gained altitude, the occasional Monarch Butterfly was seen floating on the air over the dirt path. 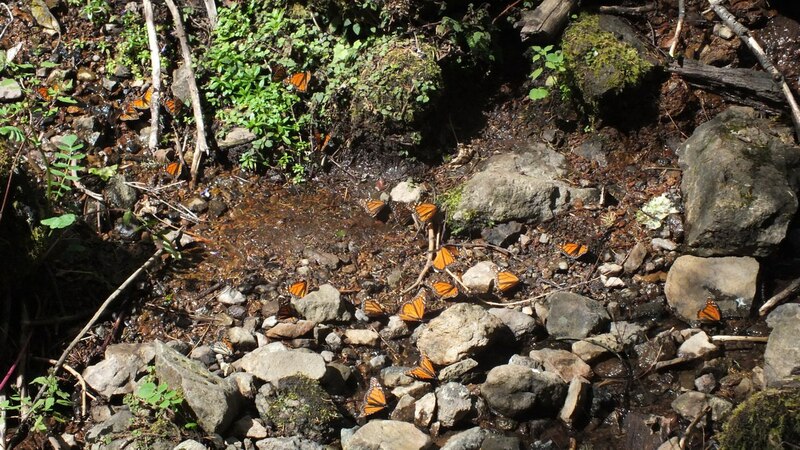 About a third of the way up the mountain, a small stream crossed the trail, and off to the left, down a slight slope, a small collection of Monarchs was availing itself of the moisture while absorbing the warmth of the sun. I was so taken up with the promise of things to come that I forgot about my aching finger. 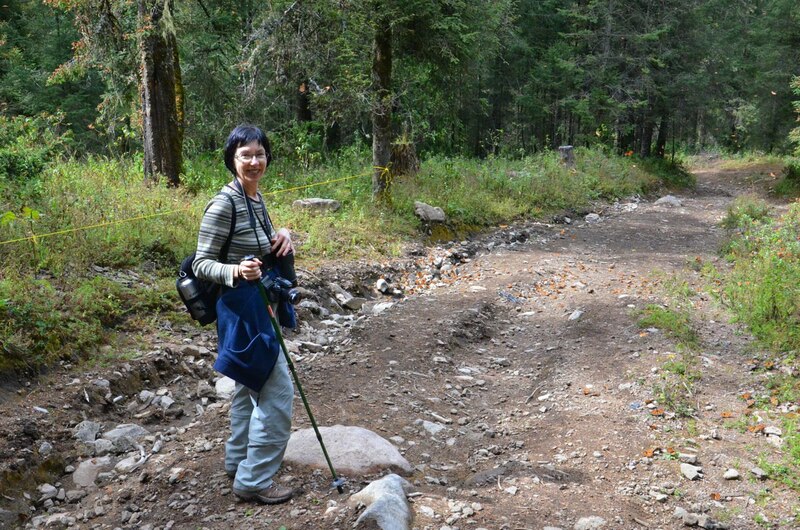 Although the trail was steep in most areas, it did level off for stretches at a time, and given the rocks and loose dirt, Bob and I appreciated our hiking boots and walking sticks. The temperature was perfect for hiking. The air grew cooler as we climbed, and yet I found it necessary to remove my fleece sweater and cardigan. Further along the trail, the sky began to fill with Monarch Butterflies in flight, a foreshadowing of what was in store ahead. They had been enticed from their perches by the warming rays of the noonday sun. I was not prepared for what lay ahead. 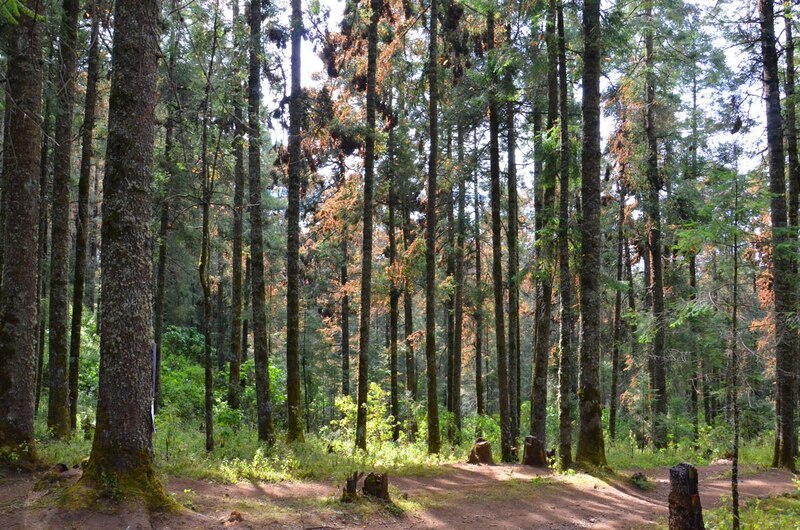 I thought, in my ignorance, that we would walk under the canopy of trees the whole time and that the bulk of the Monarchs would be resting on the boughs of the oyamel firs or white cedars. 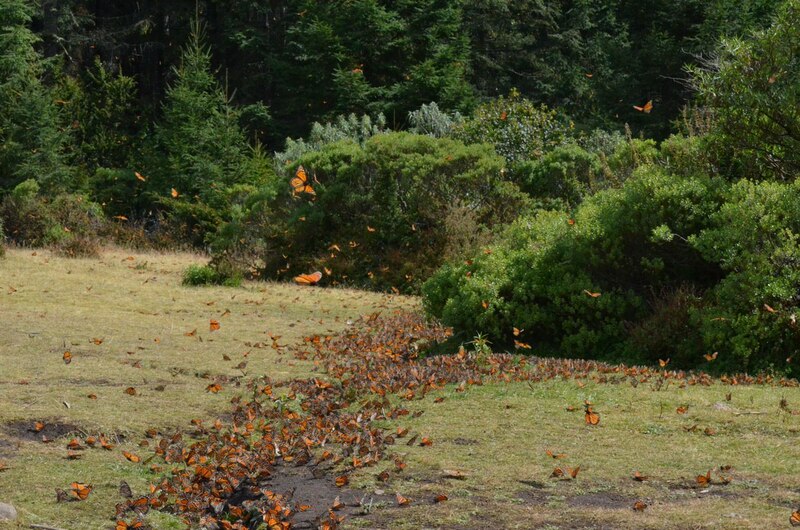 Instead, the trail opened up to a wide open meadow were thousands upon thousands of butterflies were assembled on the ground, gathering moisture from the frail stream that cut a narrow swath across the grassy area. The sight moved me so much that tears were streaming down my cheeks. It was overwhelming to think that, there, somewhere amongst the hundreds of thousands of Monarch Butterflies, was perhaps the one that had hatched at Tommy Thompson Park in Toronto and managed to survive the flight to this winter oasis. As Bob and I looked on, Butterflies swirled all around, at times tickling our noses or brushing our hair as they passed by. A guardian sat watch over the area to make sure that no one accidentally stepped on the regal insects, to offer suggestions as to where we should walk, and to admonish anyone who spoke in other than hushed tones. Bob and I were mesmerized by the spectacle. I felt so protective of each and every one of these intrepid travelers that had completed the longest migration of any species on earth. 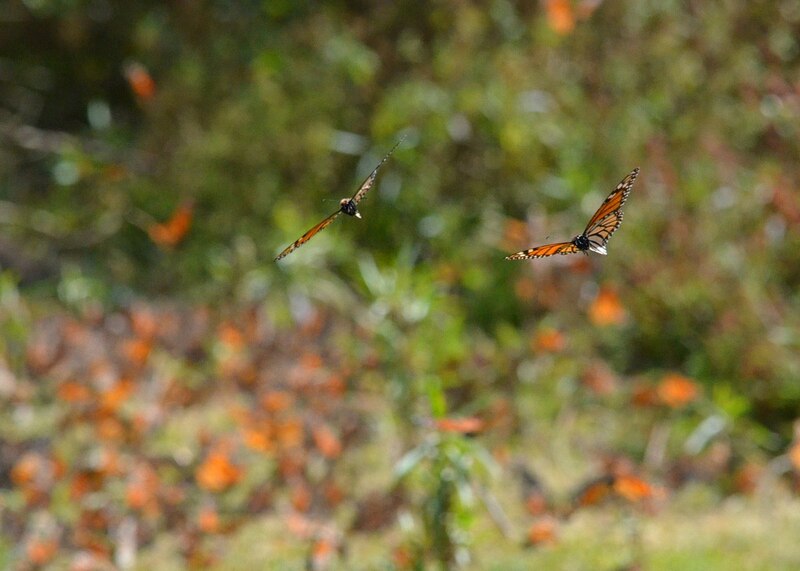 It was impossible to see the ground beneath their wings where the Butterflies were so thickly congested. 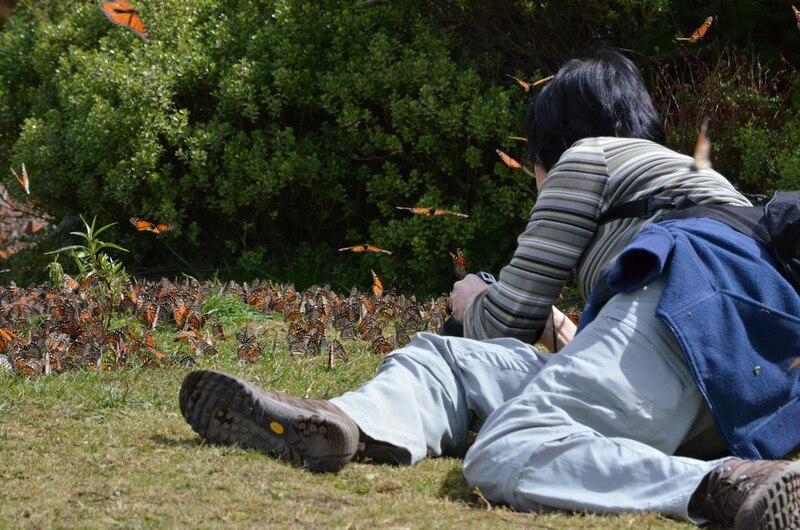 The Butterflies were not disturbed by our presence so it was possible to move in close for photographs. Their primary goal was to quench their thirst and warm their bodies. 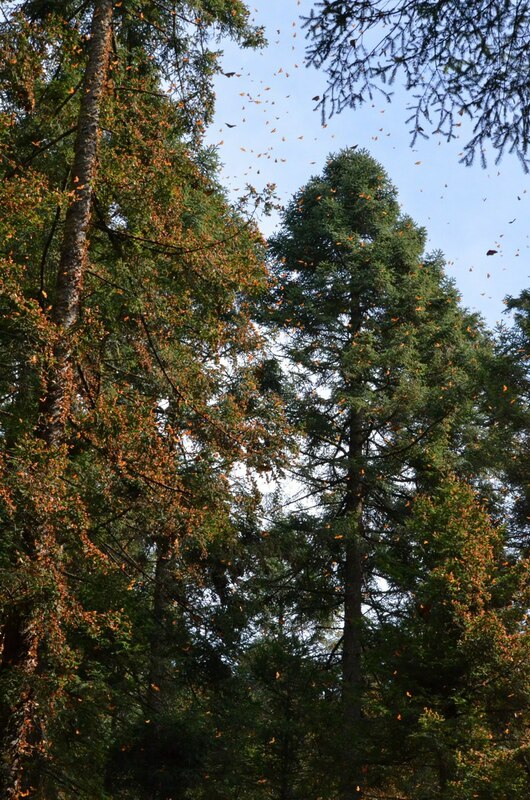 During their winter hibernation, Monarch Butterflies do not eat, but must, with regularity, move from the trees to take moisture and minerals from the water and damp soil nearby. The nights in the mountains are very cold, so on sunny days, the Butterflies are warmed sufficiently to enable them to fly short distances. 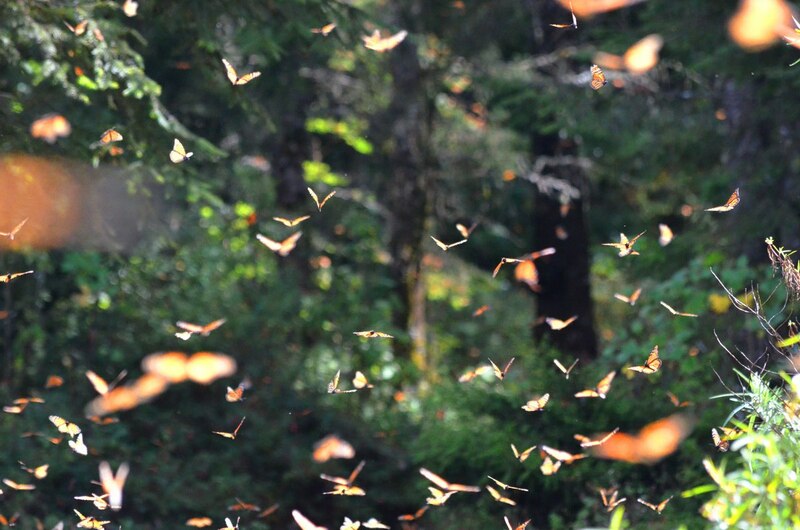 As they linger near the stream, the Butterflies count on the sunshine to keep them warm so they have sufficient strength and mobility to return to the tree branches before the forest gets too chilly in the afternoon. Bob and I were free to remain in the meadow as long as we wanted. 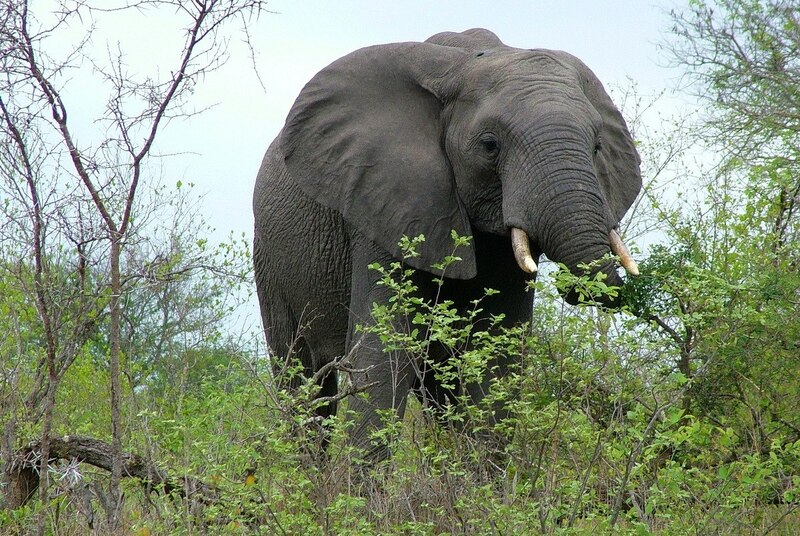 Our guide quietly conversed with the guardian on sight, and we reveled in the dream-like atmosphere that embodied us. 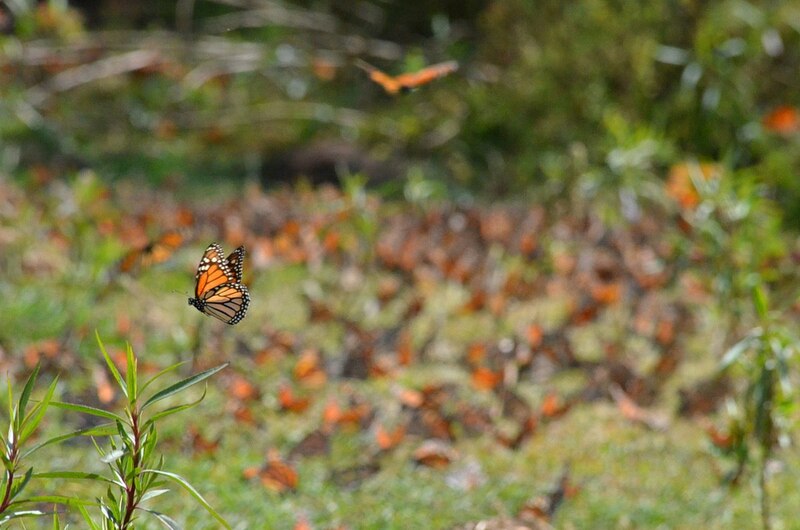 It was a great time for reflection and consideration of the miracle of Monarch Butterfly migration. The meadow encompassed an area about one-acre in scope, and we were amongst a handful of people that had arrived behind us. Being mid-week, few visitors make the trek to see the Butterflies, but come the weekend, we were warned that the place would be crawling with spectators. and we wondered how such delicate, exquisite creatures could survive on water alone for months at a time. 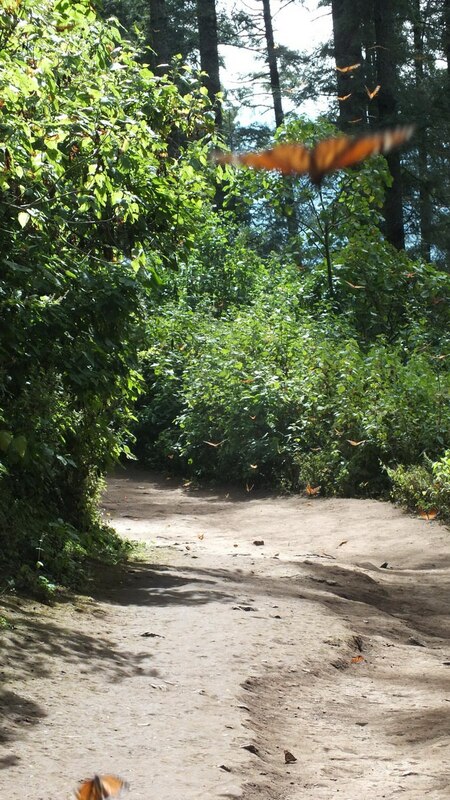 When we were ready, our guide indicated where we would proceed further into the forest, higher up the mountain, because the Butterflies would soon be making their way back to the shelter of the trees. It was then about 2 p.m. 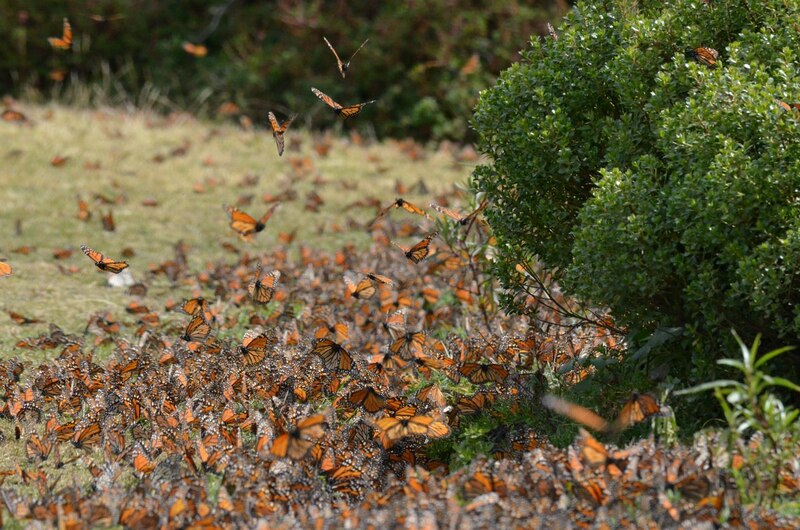 The custodians of this particular butterfly preserve do not take lightly their responsibility to protect the Monarchs. 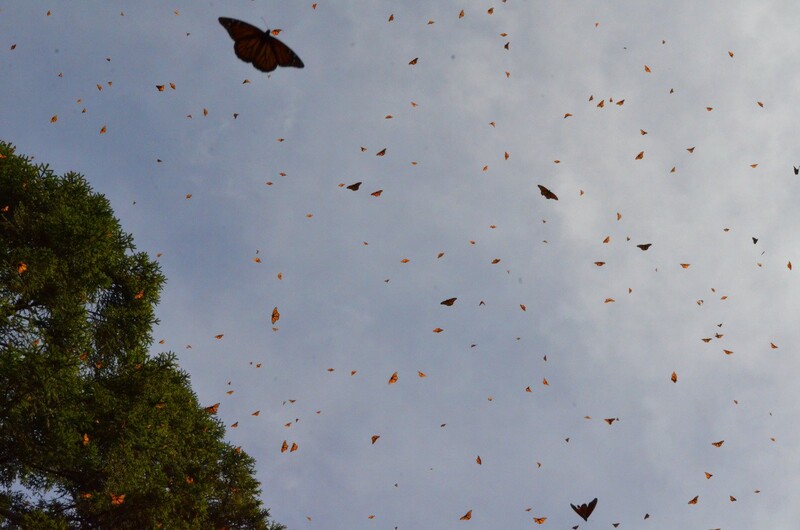 Each day, the location of the Butterflies has to be determined for they do not always return to the same trees or the same area of the forest every night. 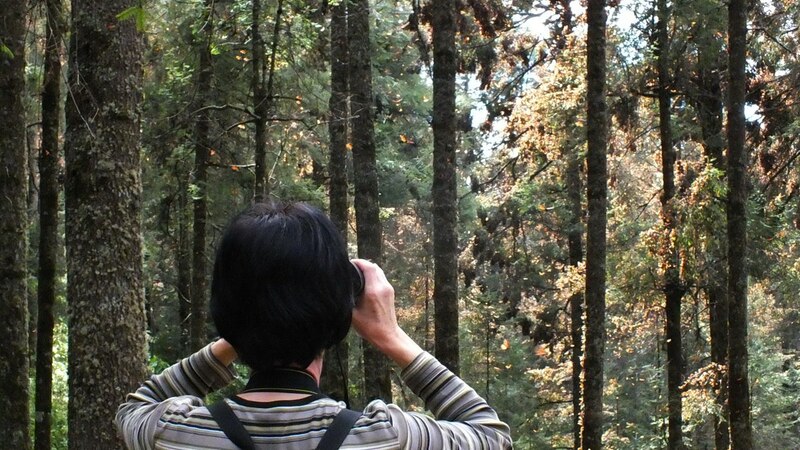 That is why a guide is required to lead visitors to the present sight of the Butterflies’ occupation. Ropes that can be adjusted define the limits of where visitors can walk without disturbing the dainty creatures. 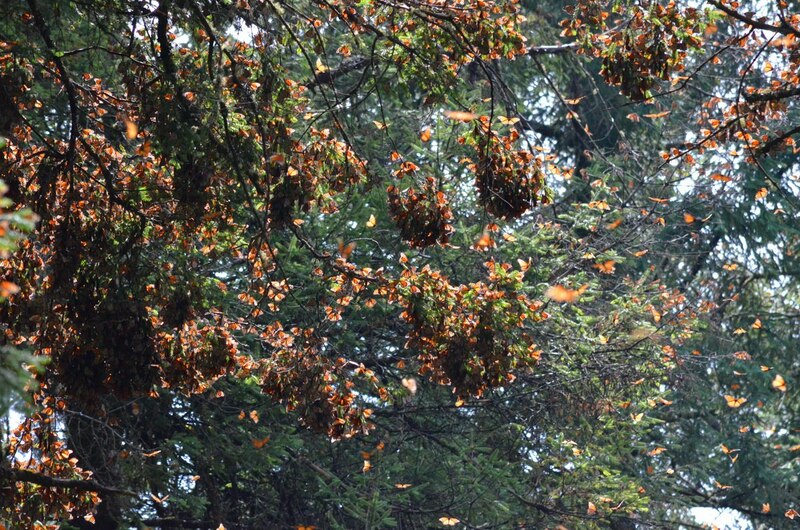 When we caught our first glimpse of the butterfly-laden branches, we were in total awe. Photographs do not adequately capture the density of the colony. For as far through the trees as we could see, the vegetation was transformed into a canvas of orange. 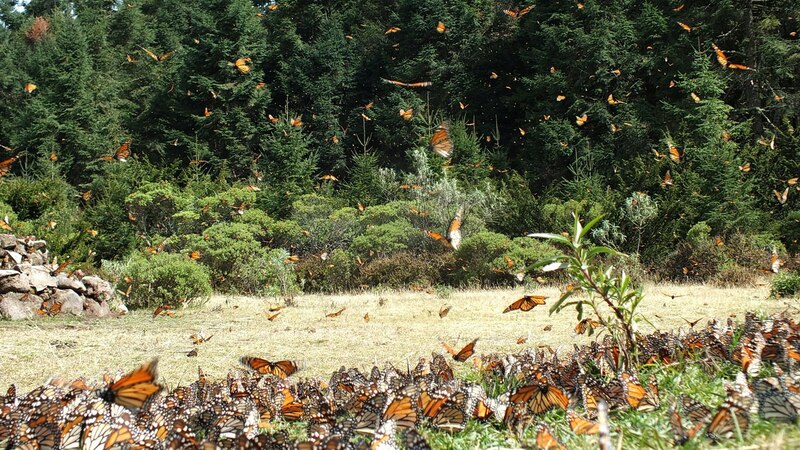 I could not even imagine what the meadow would look like if all of these millions of butterflies descended at one time. There would not be room at the stream to accommodate them. 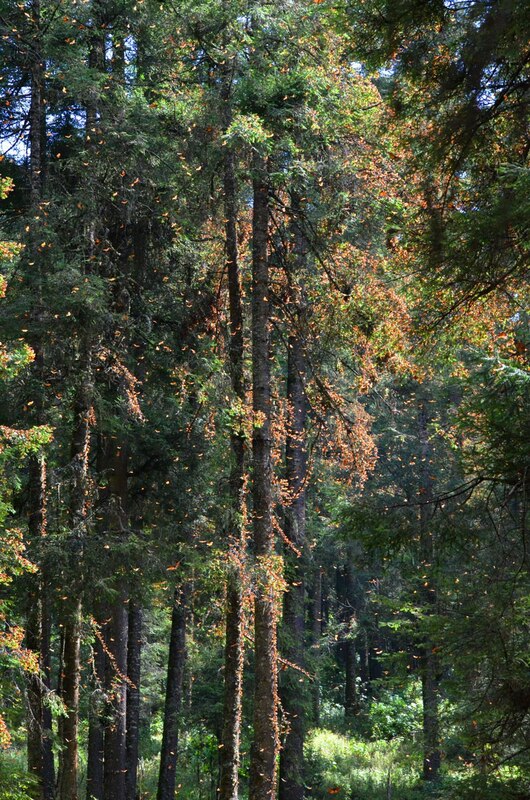 As Bob and I stood silently in the forest, the solitude was disrupted by the pumping of the butterflies’ wings. Like one might detect a swarm of flies or bees by a hum in the air, the beating of the Monarchs’ wings, and the vibration of those at rest, literally caused a disturbance in the air that could be heard. That was so marvelous. essentially transforming them into gilded boles topped with flaming limbs that sag under the weight of the millions of miniscule migrants. By the way, as the hours passed, the swelling in my finger eased, and my rings once again fit loosely…emergency forestalled. On our return to the Visitor Centre, I was heartened to see the efforts of forestry personnel and environmentalists evident in the thousands of oyamel fir saplings being nurtured on sight. 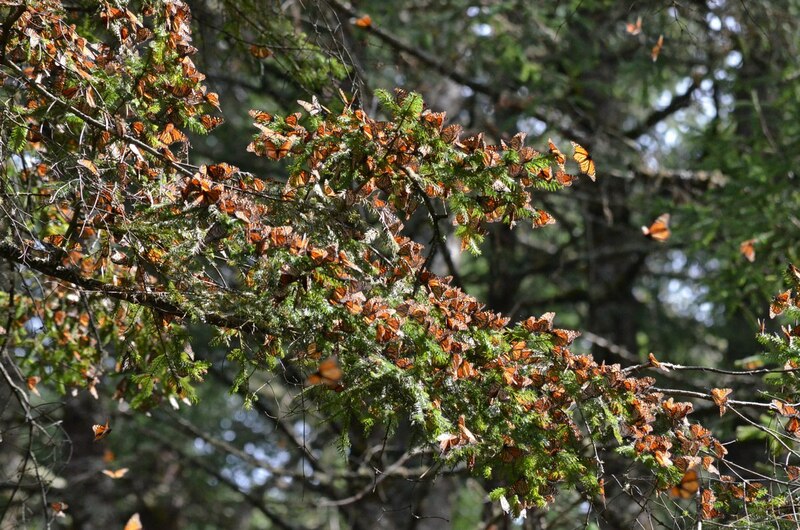 Attempts are ongoing to replant the clear-cut mountain slopes with these native trees to broaden the pockets of trees required by migrating Monarch Butterflies. 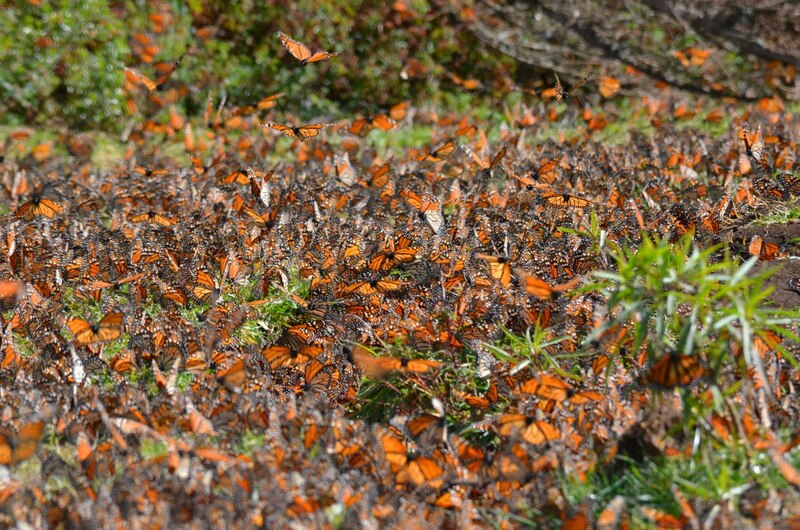 For now, El Rosario Monarch Butterfly Reserve is one of only a few areas in Mexico where the necessary trees are protected for the sake of the Butterflies. I was thrilled to learn this week that the numbers of Monarchs this year have significantly increased over last year’s lowest-ever count. 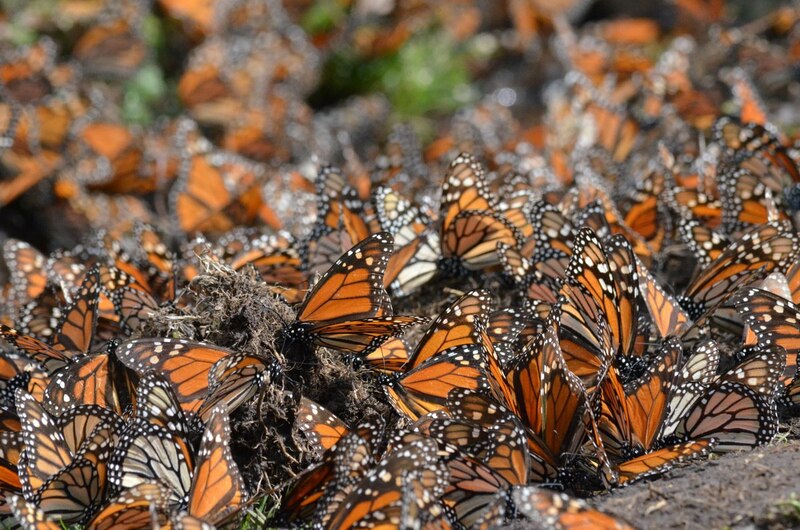 Last year, it was estimated that 34 million Monarchs were overwintering in Mexico. A slight rebound in their population has scientists putting this year’s number at closer to 56.5 million, but this still represents a decline of 82% in their population over a 20-year average, and a decline of 95% from their all-time high in the 1990’s. Let’s hope that conservation efforts and the listing of Monarch Butterflies on the Endangered Species List will lead to a resurgence in their numbers that can withstand the ups and downs of bad years so that future generations will still be able to marvel at these elegant creatures that weigh a mere 4-grams each and yet are capable of flying uninterrupted for weeks at a time to reach their winter destination. They truly are miracles of nature. This is breathtaking, Bob and Jean! What remarkable and lovely photos. I’m looking out to see Monarchs this summer and hope there will be many. Thanks so much, Cynthia. Yes, I sure hope that the Monarchs start to show up soon. So far, we haven’t seen a one. The Milkweed plants are healthy and rich with fragrant blossoms just waiting for the Monarchs to arrive. Let’s keep our fingers crossed. I loved you post about your trip! I have raised Monarchs from eggs ever since I was a little girl growing up in Hawaii. When I married and became an elementary teacher in Ohio, I taught my students about Monarchs and we raised them in the classroom each fall. It was always a special time when we released them, hoping that each one would survive their long journey to Mexico! I have raised thousands of these fragile creatures and await their return to my gardens each summer. I am happy to hear that their numbers are on the rise! Your pictures are an inspiration and I hope to make it to their winter sanctuaries next year. Thank you! Alicia, it is so inspiring to read about someone like yourself who has had a life-long dedication to these magnificent butterflies. You are to be commended for sharing your excitement and knowledge with your students. Thanks for checking out our blog posting and for your lovely comments. Thank you for posting your experience in Mexico. It was so magical! The photos took my breath away! There are great strides being made this coming year in the US by so many individuals and groups which will hopefully lead to a larger population in 2016. I will work harder to do my part by teaching as many people as possible about the monarch and raise many here at home. Thank you! You have given me renewed hope that the Monarchs will continue to grow in numbers simply because of efforts by people like you. Thank you for spreading the word. I am glad that you took pleasure in reading our blog posting and that the photos made an impression on you. A few things. Please let me know in the fall if you discover any roosts like the one you saw in Etobicoke, and I’ll be there in a flash. Thank you for this outstanding review of your trip. These shots compare to the best I’ve seen, and I’ve seen a lot. I was under the impression that the guides in the reserves do not allow people to go off the trail. You had the amazing opportunity to sit among the monarchs. Is that because you weren’t with a guide? Thanks for your interest in our story, Carol. 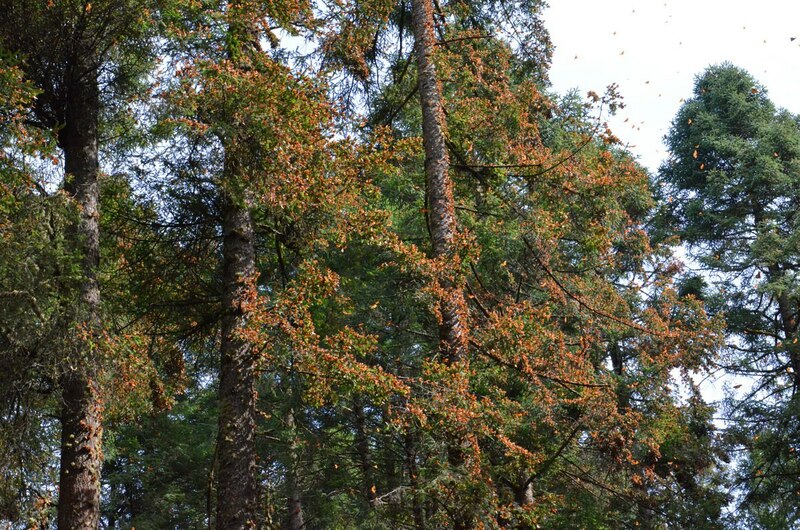 We traveled with a guide, as I believe all visitors are required to do, and only had access to certain trails nearby the roosting Monarch Butterflies. 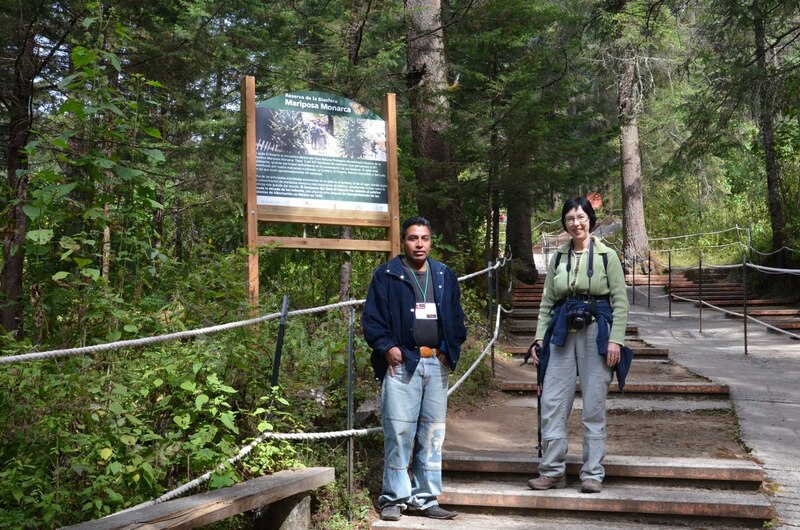 Any of the trails that Bob and I walked were also open to other visitors. 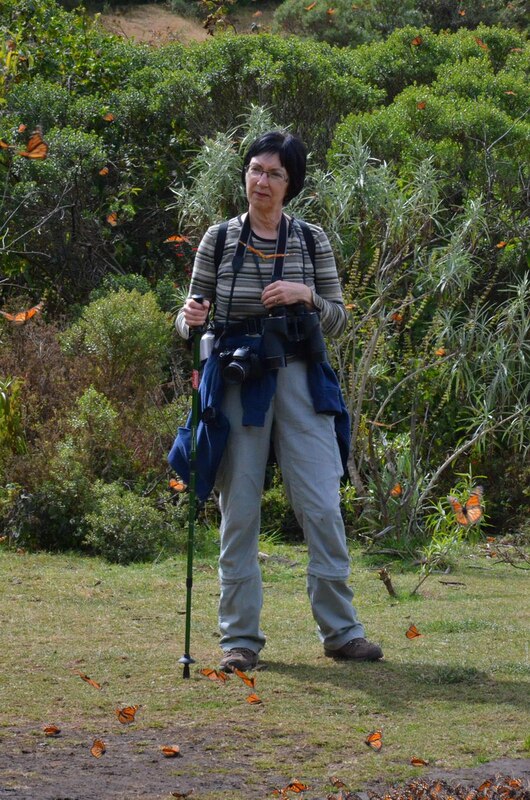 As for sitting amongst the Monarchs, the meadow was closely monitored by a steward of the site who required each person to be extremely careful when walking, moving or sitting down so as to avoid injury to any of the butterflies. If anyone overstepped their bounds, the steward was quick to intervene. Thanks for your reply. 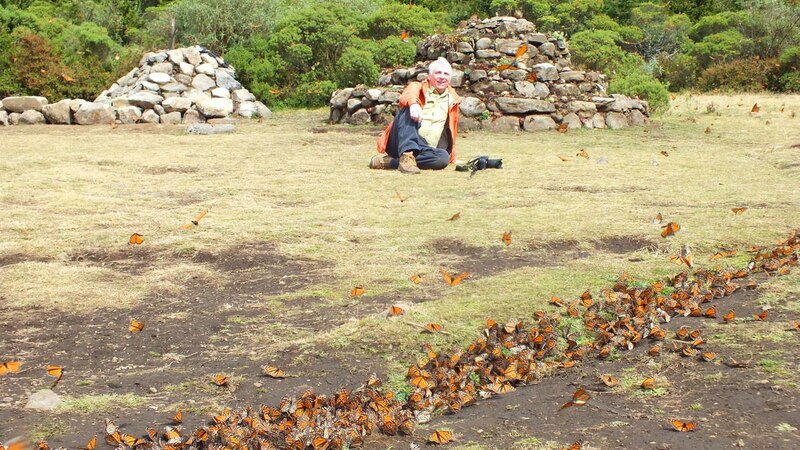 It is great to know that, even with a guide, you can still sit and walk amongst the monarchs. I hope to go next year. And you went in January, while most people say that mid February is better. Good to know. I shared this post on my Facebook page, Monarch Butterfly Crusader. Countless people are now enjoying it. We went in January in order to avoid the huge crowds generated by the annual Butterfly Festival. 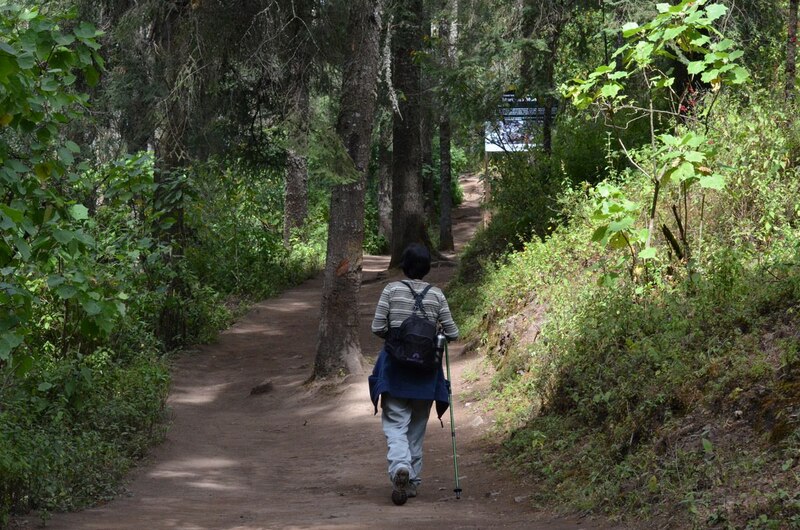 Doing so had us enjoying very quiet surroundings at our hotel and hence very personalized attention, and at the butterfly sanctuaries, trails free of crowds and the ensuing hubbub as people move in large groups towards a common destination. Thank you for sharing our post on your Facebook page. Would you mind pointing me in the right direction to find out when the butterfly festival will be next year? I don’t like crowds either. 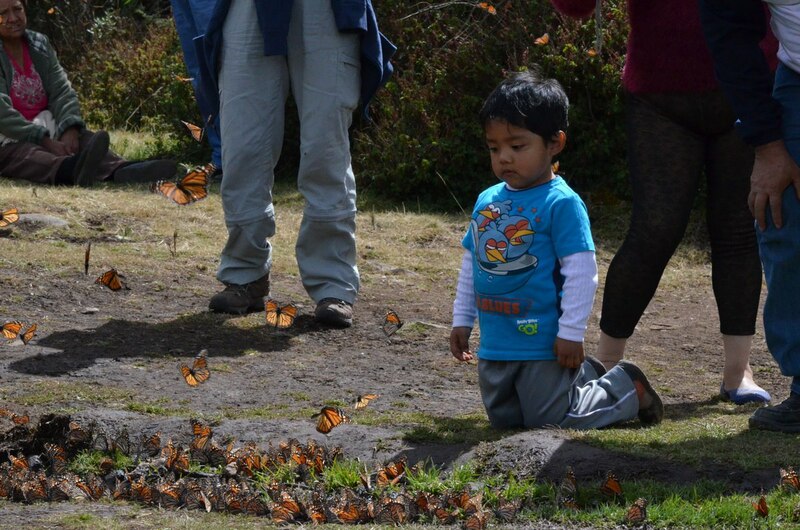 I was not able to locate an exact date for next year’s butterfly festival, but below is some information that I acquired off of one website: There is a yearly one-week long cultural festival, the Festival Cultural de la Mariposa Monarca, that takes place at the end of February / beginning of March. Hope this helps when you plan your trip. Thank you for sharing your experience, so beautifully written. My heart filled when I thought – perhaps – some of our monarchs we all raised and released in Iowa might well be there. Did you happen to see any with tags? We live in Connecticut, and I’ve been raising Monarch butterflies from eggs or caterpillars for the last 38 years at home, and also with my special education class at school each year. It is so rewarding to share this with children, and even after all these years, I am in awe of the transformation- nothing short of a miracle. I’ve taken probably 400 pictures of individual children and teachers holding butterflies before we release them, and every face is calm, smiling, and serene! I’m retired now, and hopefully we will get to El Rosario soon and see what you saw! Thank you for reading our blog posting. 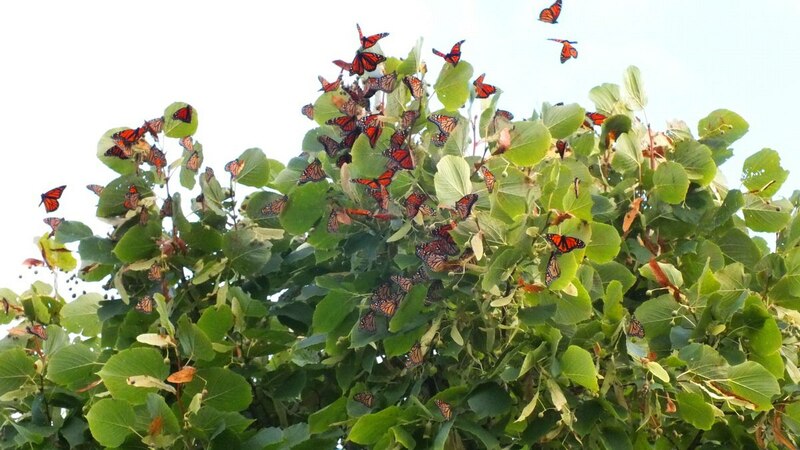 I can just imagine how rewarding it is to share the life cycle of Monarch Butterflies with your school children. This past summer, when Bob and I were monitoring the only chrysalis we were able to find in the wild, we, ourselves, were like two giddy kids keeping secret the location so it would go undisturbed. It was so disappointing to have the adult emerge in our absence, but it was impossible to arrange to be on site at the precise moment. Do you mind if I ask you where you get the eggs and caterpillars? 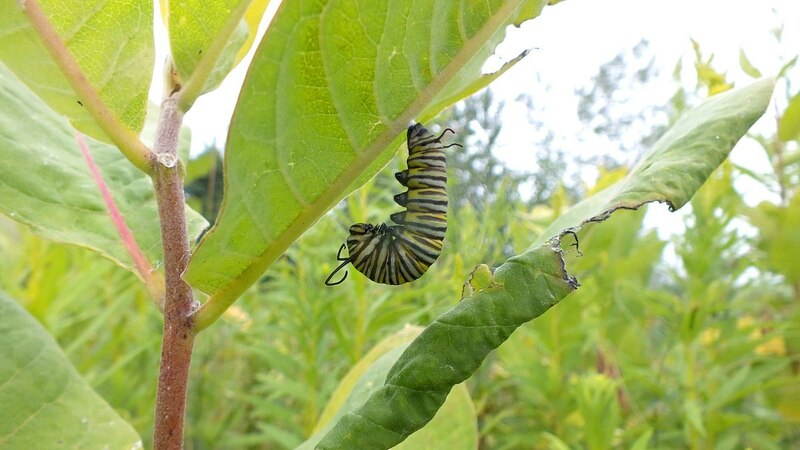 If you plant milkweed and nectar plants, monarchs will come to you and lay their eggs in your garden! They can only lay their eggs on milkweed. I had some plants in my yard for just a few days before I found eggs on them! If you plant it, they will come. I love your pictures, and hope to make that trip some day! Thank you so much for sharing, I would love to go there someday. Your photos and dialog were so good and interesting. I have been raising Monarchs since 2007, have released over 2000 since then, I am trying to do my part and would love to see where they migrate too, hopefully their numbers keep going up. Thanks again for sharing your story and fantastic photos. It is our pleasure to share our experiences. It gives me satisfaction to document, for ourselves, the highlights of our trips and our impressions of the places we have visited and sights we have seen. I’m glad you enjoyed reading about the Monarch Butterflies. You would find it really fulfilling to see them where they winter knowing that you have contributed so much to their success. Keep up the good work. 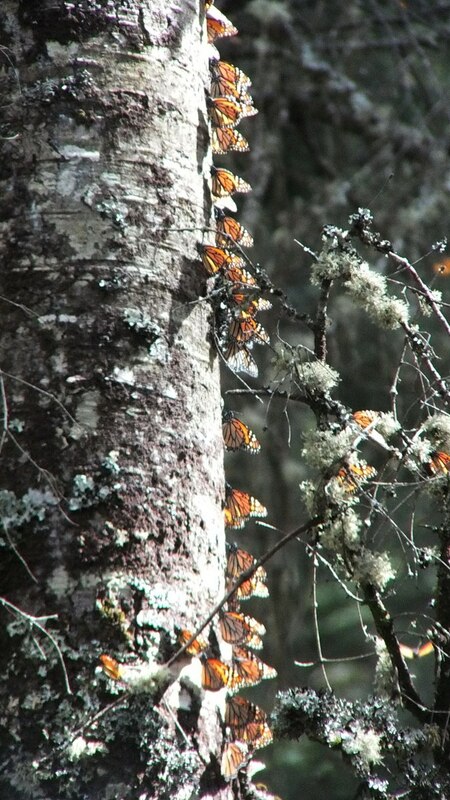 I have been yearning to see the Monarchs. You made is sound so feasible using your own transportation. Do you recommend going this route. I would like to take my family with grandchildren. Do you see many children ages 8yrs and up? How was the food? How were the accommodations? DId you rent your vehicle? Can you recommend any tours from other tourists there? Thank you very much! Charlene, Bob and I visited three different sanctuaries over the course of a week, and I think the little child in the photo at El Rosario was the only youngster we saw, but we were visiting on weekdays. 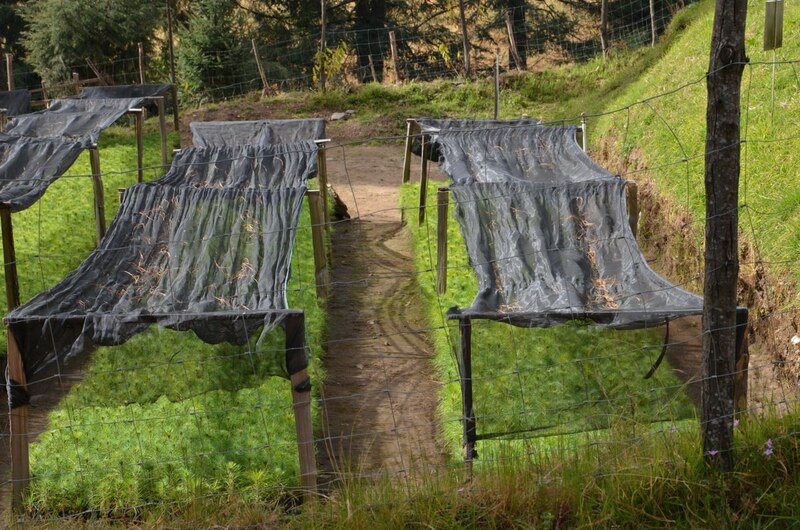 Our accommodations at Hotel Rancho San Cayetano were excellent, and that is where we ate breakfast and dinner each day. The kitchen staff were happy to pack a boxed lunch whenever our sightseeing took us away from the hotel, and the food was delicious. Because we traveled independently, we rented a vehicle, but it was very challenging getting around owing to the lack of road signs that name streets or give directional input to even the most significant tourist attractions. Unfortunately, I do not have the names of any tour companies to recommend, but I would strongly suggest going that route especially if traveling with your grandchildren. Thank you for sharing. We will be there in about a week. Thanks for adding to our excitement! Hi Rebecca. You will surely enjoy the experience regardless of which butterfly sanctuary you go to. We visited three different ones and found each of them very worthwhile. I feel compelled, gratefully, to express my awe and appreciation for everything I just read and saw in this Monarch story and footage you have presented. 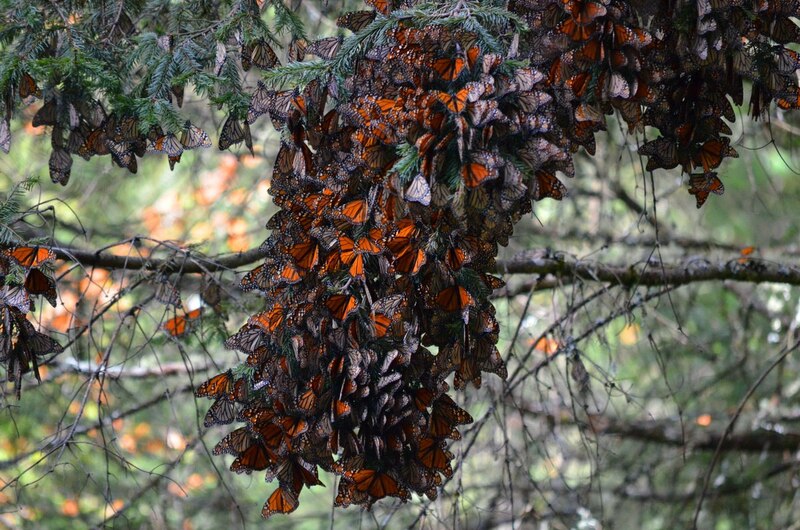 I had only a vague idea of the Monarch migration and it wasn’t very accurate at that. This has been a delightful discovery and a real TREAT! Thank you, thank you. PS: What a lovely “hobby” you two are blessed to enjoy together. Julie, thank you so much for your kind words. 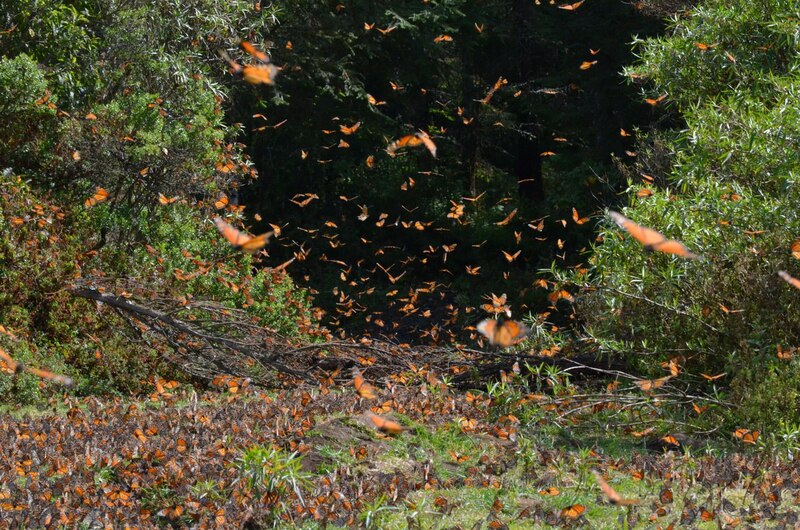 We are constantly learning ourselves and found our visits to the Monarch Butterfly Sanctuaries very rewarding. Our trip not only fulfilled a dream to witness this awesome phenomenon but had us enjoying the wonderful scenery and people of Mexico. The warmer temperatures were certainly appreciated as well. 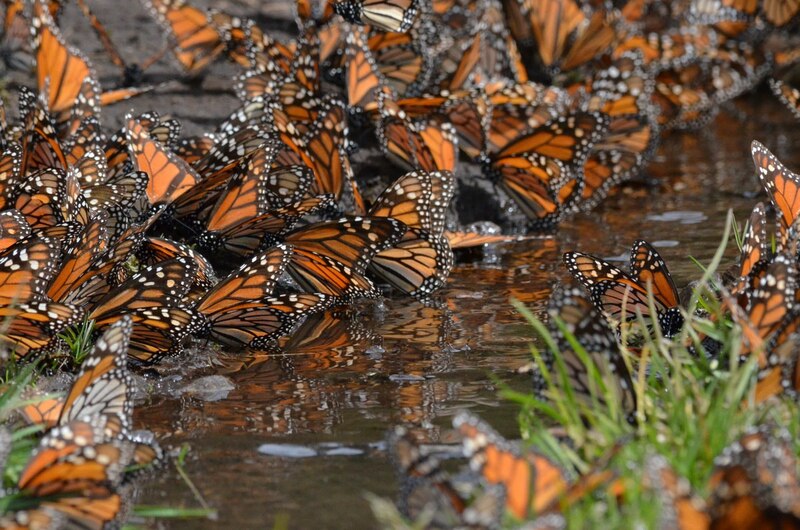 Thank you for sharing your wonderful photos and video of your trip to see the Monarchs in Mexico. I was there in late February of 2013. All I can think of is that need to go again. It is a magical place. Thanks for reading our blog. 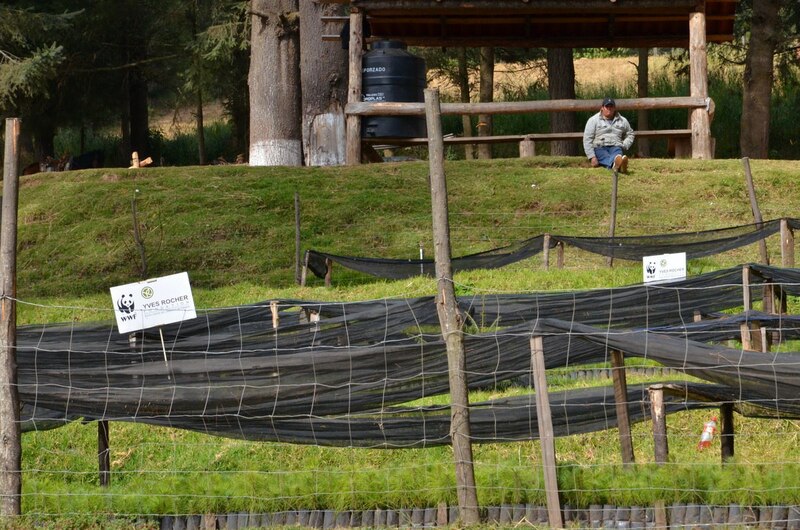 This was our first time visiting the sanctuaries in Mexico, and we found it very special, almost spiritual in nature. We were thrilled to learn that the numbers were up over last year’s and hope that efforts in both the United States and Canada help the butterflies to continue that trend.